We know it’s only March, but warmer weather is just weeks away. Why not consider spending some summer days at the Cliffside Beach Club in Nantucket? This luxury beach resort has everything you need for an R&R holiday. Choose from a range of accommodations, from guest rooms to suites to two-story beach houses, each equipped with a flat-screen TV, free WiFi and a mini-fridge. Step outside your room and soak up amenities that include a 3,000-square-foot spa and fitness center, three outdoor pools, and private beach space with complimentary chairs and beach towels. And don’t miss a meal at the Galley Beach Restaurant, which serves up global cuisine inspired by Nantucket’s seafood and the restaurant’s organic garden. Sound good? 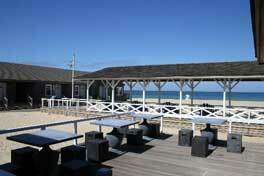 Visit Cliffside Beach Club at 46 Jefferson Ave., Nantucket. For info, call 508.228.0618 or visit cliffsidebeach.com.